Pearl Knotting is Fun and Easy! 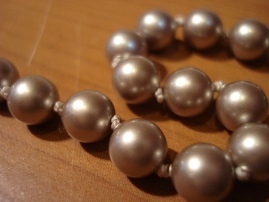 Nothing compares to the drape and look of hand knotted pearls. It's easy to do, and we'll teach you how! You can use this technique with pearls, gemstones, glass, and more to make beautiful and unique jewelry. If you have an heirloom strand that needs repair, you'll be able to do it yourself. We'll teach you this technique using silk bead cord and freshwater pearls, and your class fee includes knotting tweezers, instruction booklet, and enough freshwater pearls and supplies to complete an 18" necklace.